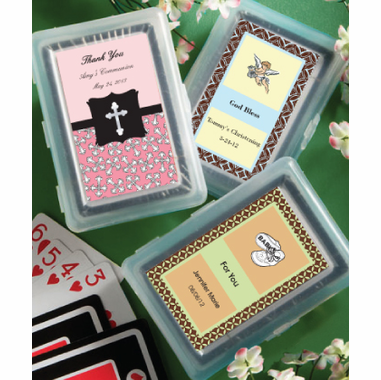 If you are looking for a favor that won't break the bank, order our Communion playing cards. 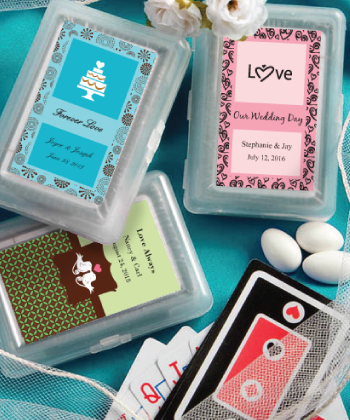 Your guests don't need to know how cheap these very practical favors are. They will just enjoy playing card games with them. 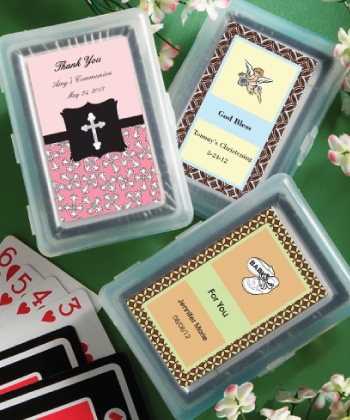 Each guest will receive a full deck of cards with a standard suits design on the cards and a personalized label for you to affix to the hard molded plastic case which opens like a book. Your personalized labels are not applied to the card cases prior to shipping - assembly is required for the personalized labels to be affixed to the box. This is how we can make them so inexpensive. See the lower inset photo to view the red, black and white suits design that is the standard on the playing cards. Please be aware that only the label is personalized, the cards themselves are not. Labels come in sheets that you place on the plastic case Cards measure 2.5 x 3.75 x 0.75 inches. Sold bulk packaged in individual poly bags.